Preparation:Slice squash in medium slices. In large iron skillet melt bacon grease or olive oil; when melted add the squash and onions in layers, sprinkling salt and pepper between layers. Cover and cook over low heat. When squash starts to become tender, mix gently and chop the squash a bit as you mix, but not a lot. Cook until squash is tender, about 20 minutes or so. I suggest using the olive oil for a heart healthy version. Directions Preheat oven to 350 degrees F. In a large bowl, combine flour, salt, nutmeg, baking soda, cinnamon and sugar. 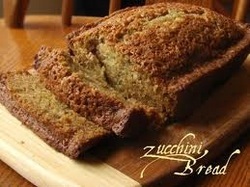 In a separate bowl, combine oil, eggs, water, zucchini and lemon juice. Mix wet ingredients into dry, add nuts and fold in. Bake in 2 standard loaf pans, sprayed with nonstick spray, for 1 hour, or until a tester comes out clean. Alternately, bake in 5 mini loaf pans for about 45 minutes. Whole strawberries will add even more taste to your strawberry jelly. If you like strawberry jam, you will just die for this one! The whole fruits give the jelly a very special taste. Off course it is a little bit more difficult to handle, because the whole strawberries tend to fall off the bread. Cut the strawberries in pieces and put into a bowl together with sugar and fruit pectin. Leave the bowl (covered with a towel) in a cool place til the next day. Stir once in a while. Boil mixture then simmer for 5 - 10 minutes. Stir frequently. When finished take off the foamy top layer of the mixture. How to know the jelly is finished? Put one teaspoon of the hot mixture onto a plate, if it gelatinizes, the jam is ready. Pour the hot strawberry jam in hot sterilized jars. Make sure to fill it up to the top. Clean the jars with a damp towel. Close tightly. After 10 minutes turn around and place jars on the lid. Let cool down, turn around again and store. A significant advantage of farmers markets is that they are generally situated in an ideal location to reach consumers. The fees for a space are usually very minimal and most regulations and restrictions- zoning, sign, health department, business license- are already worked through by the sponsoring group. Little or no packaging is required. All you really need is a creative, clean display and a truck! Farmers markets allow you to interact with customers, educating them about your farm and how food is grown. You get a chance to pitch your product to the customer. Since most farmers don't use the farmers markets as their only outlet, it also becomes an opportunity to promote other aspects of your business, such as Community Supported Agriculture (CSA) arrangements, roadside stands, pick-your-own, deliveries to local restaurants, agri-tourism, etc. Feedback from customers is almost immediate. Customers are your most valuable link to market trends and demands. They can offer new product or marketing ideas. If you're unsure how a new variety might sell, experiment with a small amount before committing to production on a larger scale. Feedback from other growers and vendors is equally valuable. Growers can share information on crops, growing techniques, market ideas and cooking. 1. Melt 3 Tbsp. butter in a 10-inch ovenproof skillet over medium-high heat; add chopped zucchini, squash, and onion, and sauté 12 to 14 minutes or until onion is tender. Remove skillet from heat. 2. Whisk together eggs and next 3 ingredients until well blended. Pour over vegetable mixture in skillet. 3. Bake at 350° for 33 to 35 minutes or until edges are lightly browned and center is set. Sprinkle evenly with chopped fresh basil.